The United States has a very large Indian community in many of the large cities such as New York, New Jersey, Los Angeles, Chicago, Dallas, San Francisco Bay Area among others. Some of the stores are small mom and pop stores selling basic needs such as rice, dals, spices and vegetables. These stores probably have most of the things you would need to do typical Indian cooking. However in some locations like New Jersey, the Indian grocery stores are really large. These stores are almost as large as the American Grocery stores and sell other products such as cooking utensils, DVDs, CDS, Books and Magazines etc. They also carry a larger variety of the basic products. 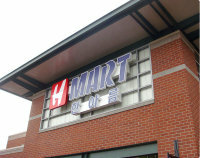 The Indian Food & Grocery section of the website has a list of such stores. The site currently has over 2500 Indian food & grocery stores listed in the United States. If you think one of the stores has incorrect data or if you have a new store you would like listed, please do contact us. We would greatly appreciate it, if you would provide a review of these stores. If you think that Diabetes only affects the obese and old, you are sadly mistaken. I was 36 years old, 63-65 kgs in weight when I was diagnosed with Type 2 diabetes. I am from the Indian sub-continent and diabetes runs in my family and most of the males have got it at an early age. Going by that I knew that diabetes would be in my life as well. According to the International Diabetes Federation, there are over 366 million people with diabetes around the world and over 50 million reside in India. Based on the circle of family, friends and colleagues, it appears to me that Indians have a higher risk of being diabetic, often at younger ages. 14th November is World Diabetes Day and I wanted to spread the word about the disease and help raise awareness. Growing up, I knew my father had diabetes and that he took medicine but he never really educated me on what the disease was, how I could help him and hopefully use that knowledge to delay the onset of my diabetes. It was a different time and perhaps he did not realize the importance of educating me. He eventually passed away from a heart attack, probably a result of his diabetes. I never really learned much from all that and continued to make mistakes of drinking soda, having sweets and having too much food especially rice. I oddly never gained much weight despite these bad habits. Eventually at age 35, I started showing signs of diabetes and was diagnosed with Type 2 diabetes at age 36. It changed everything and now I had to watch everything I ate and can no longer eat like I did before and that will be the case for the rest of my life and will get worse as I get older. Over the last few years, I see many around me, who are at the risk of diabetes but just don't care (like I was a few years ago) and I feel the least I can do is educate them. I have a 6-year old son who knows about diabetes and what he should avoid. He stays away from soda completely, he limits how much sweet stuff he has every day. If he is offered a 2nd piece of cake at a birthday, he asks us if he can have it. The best thing he does is remind me to stay away from things that are bad for me. I know I must do that so I can be in his life for as long as I can and that he can delay the onset of diabetes in his life (or hopefully never get it or perhaps a cure will be found in the next 30-40 years). Diabetics - If you are a diabetic like me, or have family members who have diabetes, you know that diabetics have to control their portions. The buffet is not the right place for that. Its like taking an recovering alcoholic to a pub for a celebration. Most buffets are priced with the expectations that their patrons will probably eat at least 2-3 rounds. If you are a disciplined diabetic, you will probably eat much less than what you paid for. Individuals on a diet - While you may not be diabetic, you may be pre-diabetic or on a weight loss program and again buffets are not the place to be. Wastage of Food - Buffets encourage people to waste food. If you don't like it, ditch it (for fans of the movie Jaane Bhi Do Yaaron - "Thoda Khao, Thoda Phenko"). I have seen many plates go to the trash can with the food having been barely eaten. For a country with a high poverty level, its a criminal waste to throw away such food. 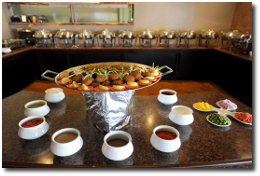 Can something be done to perhaps change the way the buffet system works in India? Perhaps...This is a thought from how food is served in my office cafeteria. A lot of the food such as salads and pastas are served by weight. You pick what you want on your plate, they weigh it and you pay by the ounce. The maximum price you pay per plate is capped, so if you take more, you don't have to pay extra for it. It works great for someone like me as I need to control my portions. Perhaps with a little help from technology, we could be take this concept to the buffets. Patrons will be provided bar codes when we opt for the buffet. Every time they go for a helping, their plates are weighed and go against the bar code. The patron know where they stand every time they refill. The restaurant can keep a couple of pricing options at 60%, 75% and 100% of the buffet value so people can decide what band they want to eat at. For those who want to go flat out, they can and for those who want to be more careful also have an option. It may sound crazy and we wanted to see what our readers think of this. Thoughts welcome. Please leave your comments below. Indians, Buffets and Diabetes - A Recipe for Disaster? According to the World Diabetes Foundation, India has the most diabetics in the world with roughly 50 million. The number is expected to grow to over 70 million by 2015. With the recent growth in the middle class wealth, there are certain elements and trends that I see that will make this situation even worse over the next few years. Genetics - I cannot say this based on any proven scientific evidence but as I look around, I feel that there is something genetically different among Indians that make us prone to diabetes. Diabetes is normally associated with overweight and people who are closer to 50. However, I was 36 years old when I was diagnosed with diabetes. I am 5'11 and was about 63 kgs at the time. My father was the same age when he was diagnosed. I know a few others now who are young, not overweight and diabetic. Is there something genetically different among Indians, that makes more prone to diabetes? Buffets and Mega Buffets - Indians are eating out more these days, especially feasting at the buffets. Almost all the major hotels and popular restaurants now offer a buffet during the week and also have the weekend brunch buffets that have a larger spread. An even scarier trend is the mega buffets that some restaurants have started where they have a separate buffet for each type of cuisine. An example of this is the Gobal Fusion in Mumbai which offers Chinese, Japanese, Thai, Pan-Asian and Indian food along with a special dessert bar. Paisa Vasool Attitude - We also have the "Paisa Vasool (Value for Money)" attitude which means most of us will over-stuff ourselves just one bite short of having the trouser button snap. It would seem as if this is the last meal for many. Dessert - No Indian meal is complete without a sampling (did I say sampling?) of desserts. Gulab Jamun with ice-cream, Jalebis, Kheer etc are great way to end a wonderful buffet. Of course, this must be followed by a Sunday siesta. India is the diabetic capital of the world and will continue to have more diabetics if people do not pay attention to their diets. I hope that anyone reading this article will be a little more careful with what they eat at the next buffet, it may just give you a slightly longer and healthier life to enjoy. I think the combination of our genetics, eating habits, lack of exercise, India is heading for a diabetic nightmare. Read more: Indians, Buffets and Diabetes - A Recipe for Disaster?